Now that Indiegogo backers’ ROK grinders have started shipping we’re seeing some in depth feedback and reviews online. Overall, the feedback has been positive, both from those folks lucky enough to have already received their grinders and also by the team here at Espresso Unplugged. We do share some of the minor gripes we’ve noted in various reviews and have detailed them below. It should be noted that none of these niggling issues have diminished our enjoyment and appreciation for the product. It’s a great bit of kit. At the risk of sounding like a broken record, we don’t sell gear we don’t use and love. Despite having no bearing on the function of the grinder, there’s little doubt that this thing is absolutely beautiful. Like the ROK espresso maker, we expect that keeping the grinder clean and dry will maintain the shiny finish of the aluminium and steel components. The ROK grinder is the first high quality counter-top hand grinder we’ve used. There’s no doubt that it’s easier to use than our other handheld grinders like the LIDO 2 and Porlex. Gone is the arm flapping that comes with hand grinders with top-mounted handles. There’s no need to lock the grinder between your knees or against your body. After seeing a demonstration of a very early prototype, we had concerns about stability and ease of use. It looked quite challenging. The addition of the sticky base padding and the move from an oval base to a rectangular one has completely allayed these concerns. Without the necessary equipment for measurement, matching grind size between the ROK and our other test grinders proved difficult, so we weren’t able to run accurate speed tests. We can say that anecdotally, we have consensus among our team that it takes less time to grind for our morning espressos than with our other grinders. It’s entirely possible that our opinions are also skewed by the fact that it’s easier to grind on the ROK. Users are reporting that grind consistency is good and this has also been our experience. Like most domestic electric and hand grinders, consistency is better at fine settings. With coarser settings, there will be greater variation in particle size that should be apparent to the naked eye. There’s no surprises here. For our team and for the majority of users who have been sharing their feedback and reviews online, none of the issues or gripes that are coming up are showstoppers. Most of the issues we’re seeing are also common to many other hand grinders. In our experience, the benefits of the grinder outweigh any minor gripes we might have with it. The short story is that you may wake the baby when grinding with the ROK. We tested a few manual grinders and one electric unit and found them to be fairly similar when measured from 30cm to the side of the grinder. To a person sitting nearby, the ROK grinder (78dB) has the same volume as a LIDO 2 hand grinder (78dB) and is slightly quieter than a Baratza Preciso electric grinder (79dB). At least for the person grinding, the ROK grinder is at a disadvantage with its open, bell-shaped hopper. Sound from the grinder is focused straight up at the user’s head. We measured the sound level overhead and at 83dB it’s noticeably louder than when measured from the side. For comparison we took the hopper lid off the electric grinder and tested it from overhead, getting a reading of 88dB. The ROK hopper would benefit from a simple cover. We’ve not yet been able to reproduce this, but there has been some feedback indicating that the grind setting may shift a little during grinding. This is difficult to assess given that the adjustment wheel rotates along with the burr. ROK grinder owner, James, was kind enough to share his experience of adjustment wheel drift with with us. He believes he’s seeing about a 0.3 to 0.4 drift of the adjustment wheel during grinding. He also suggests that this is perhaps related to the infinite washers. It’s possible that drift is mitigated by removing the washers and returning the grinder to a stepped adjustment configuration – this is actually how we’re running our grinder here at the office. We’re keeping our eye on this one and watching for more reports, including any indication whether coffee taste is negatively affected. So far we’ve not noticed any issue with extraction or taste. A grinder owner reported that with the infinite adjustment (stepless) washers in place, their grinder reaches the closed position at number 3. This is ultimately only an inconvenience, in that it makes it difficult to communicate grind settings to other ROK grinder owners i.e. your five may be someone else’s two. 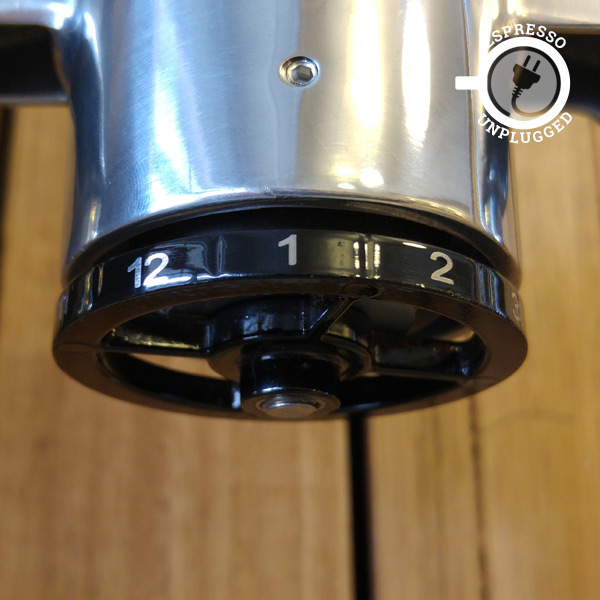 If you’re like us and own several coffee makers, we recommend writing down the various grinder settings. Zeroing (closing) the burrs may be problematic. Two users have reported that when setting the ROK grinder to the closed position, the conical burr gets stuck in place and doesn’t drop back down when turning back the adjustment wheel. This may be a one-time problem unless you plan on closing the burrs frequently. The burr can easily be poked down again from the top by using the handle of a spoon. Environmental variables like relative humidity influence the level of electrostatic charges. When humidity is low, higher static charges are generated (see Table I). Static becomes more noticeable in the winter months, in dry climates, and in air conditioned environments. Increasing humidity to 60% limits static build-up because surface moisture on materials makes a good conductor. We’ve also noticed that the static is more apparent with lighter roasted coffee that has more chaff (the light coloured, papery skin). The chaff is very light and sticks to the outer rim of the base of the hopper and around the adjustment wheel. In our limited tests, we didn’t see as much retention with darker and medium roasted coffee. We carried out our own experiment using the Ross droplet technique and were surprised by how effective it is. Click to read about our Ross droplet technique experiment. Here’s Patrick, the ROK grinder’s designer, talking about static and demonstrating the ROSS technique. Due to the open hopper, occasionally a bean fragment or two may jump out while grinding. I’ve seen users solve this with other grinders by cutting a cover from the plastic lid of an ice cream container. This happens so rarely with my grinder that I’ve not been bothered enough to address it. If you’re in the market for a beautiful and effective manual grinder and have the budget, you’ll be very happy with the ROK coffee grinder. In both form and function, the ROK is a great coffee grinder and is well worth its retail price. In a sea of failed crowdfunding campaigns, we really admire that the ROK team were able to generate enough interest to get the Indiegogo campaign funded and then get a great product out to market. Well done!